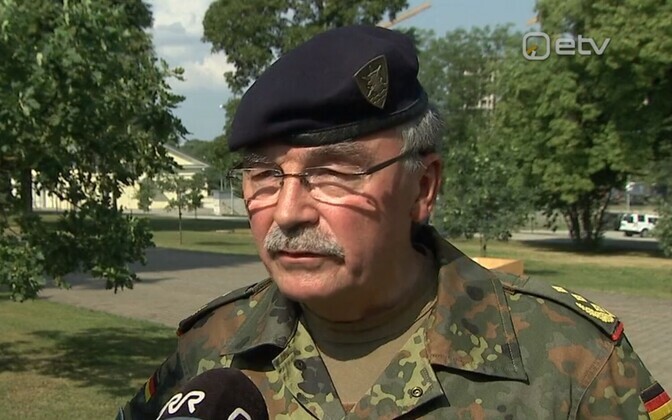 Commander of NATO Multinational Corps Northeast (MNC NE) Gen. Manfred Hofmann confirmed to ERR on Thursday that the US will not decrease its presence in Europe. Hofmann was in Estonia for a ceremony marking the changing out of the commander of the NATO Force Integration Unit Estonia (NFIU), reported ETV news broadcast "Aktuaalne kaamera." Col. Urmas Nigul handed over command and the flag of the unit to Col. Aron Kalmus, who had previously headed the Operations Department of the Headquarters of the Estonian Defence Forces (EDF). Hofmann confirmed that despite tensions between the US and NATO, the US has no plans to reduce its military presence in Europe and the Baltic states. "We are partners," he said. "And what I see so far in the development of the capacities and capabilities of the US Army forces in Europe is that there is no difference compared to the history, and that the forecast is also that it will stand at that level. And that is needed. The military advice from the American side goes in the same direction. So it's decisive to have these forces here in place."